Traditional style advice to make your outfits more interesting is: add texture and/or shine. So today I am experimenting with a little of each, to liven up my classic black trousers. It’s a gorgeous Florida Fall today so I want to shine with a dressy/casual mix. This nifty brocade jacket (similar) was thrifted in Greenwich Village for about $25. It’s by Albert Nipon, really well tailored and I love the cropped length. The knit top by CAbi (sim) is also thrifted, and the great AllSaints trousers were picked up last year in NYC. The silk art scarf (sim) is an old friend, and the boots are new and retail! (what!) by Børn. They are the darkest burgundy, not black. Love the look, and they did our seven miles a day walking in New York without a blister. The sweater has some glitter trim too. And I love this old silk scarf – it depicts Venus rising. The buttons are like jewelry! Great way to sparkle up some of your existing jackets: add jeweled (vintage?) buttons. Showing off my beloved vintage stone bracelet, from Citizen Rosebud. Ready for any adventure today brings, although if tradition holds that means wine and tempting snacks at Coasters Pub, watching NFL and screaming cheering for my teams. A Botticelli scarf is something to have. And that jacket has all that anyone would ever want going for it. Very, very nice stuff you have on today, Patti. And thanks giving to you and Not Dead Yet, that’s for sure! Love the buttons on your jacket. Nothing like a touch of shine to brighten up an outfit. Happy Thanksgiving Patti. I’m thankful for you and your glorious blog! This little jacket is gorgeous, and those buttons, adorable! You have such a fab figure Patti, you always look trim and stylish in everything. Thanks for another link up party! Love all the detailing in your jacket. You look fabulous. Loving that brocade jacket and the blingy buttons, Patti! Standing outside in a jacket without contracting hypothermia seems like a dim and distant memory in the UK of late. Wow, What a steal! I love this jacket Patti, everything about it on you. The color, print, fabulous fit on you! The buttons are so pretty and special. I look for these details on clothes as well. This jacket fits like a glove, such a pretty piece! I love the mixture of patterns and details. 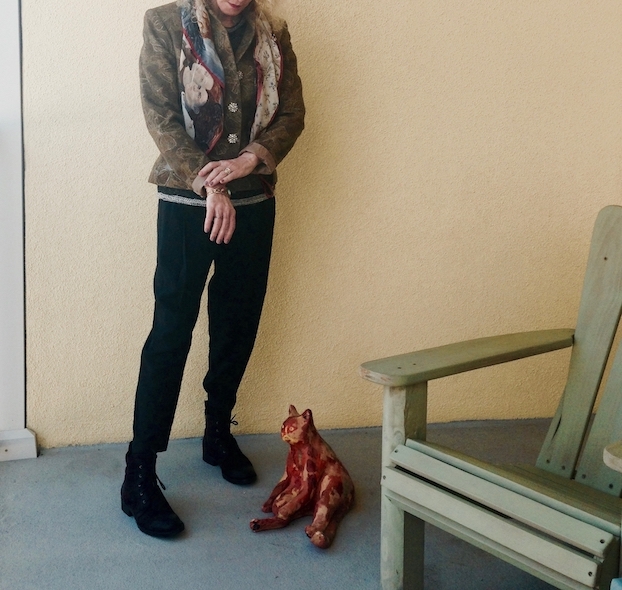 I love how you always have that cat statue in your photos! Cracks me up every time. Thanks for hosting the linkup! What a beautiful buttons! They are a real eye catcher. You look fabulous! The jacket is great – I love the fabulous buttons! And what a pretty scarf! I’m glad to see you back in cool-weather clothes. Yay for layering. Wine and snacks? Who needs football? Heh. Hope you had a great day. Thanks for the linkup party, Patti. You keep me connected. I am drooling over that jacket, Patti! Very stylish look Patty! 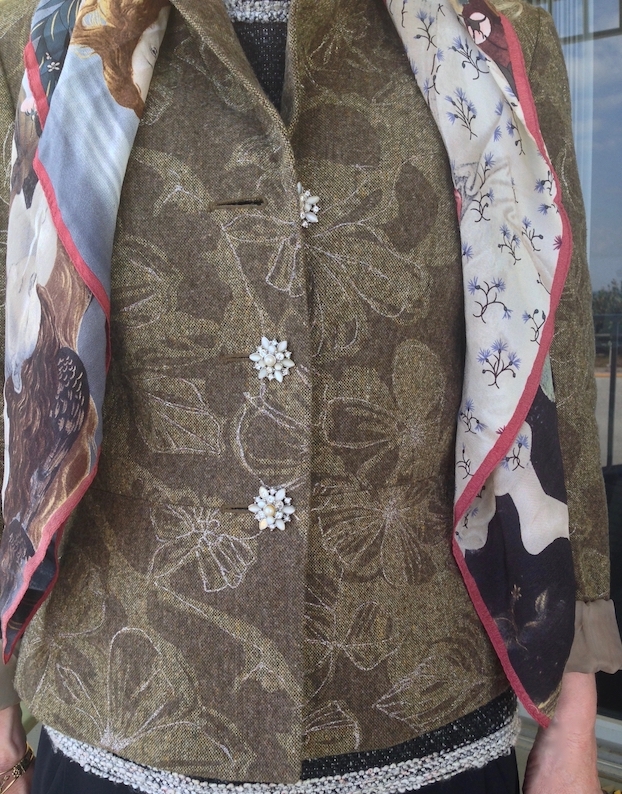 Wonderful jacket, what a lovely print and buttons! Gorgeous outfit, Patti. I love the scarf with that jacket and the colors in both together. Oh, I love those buttons!!! 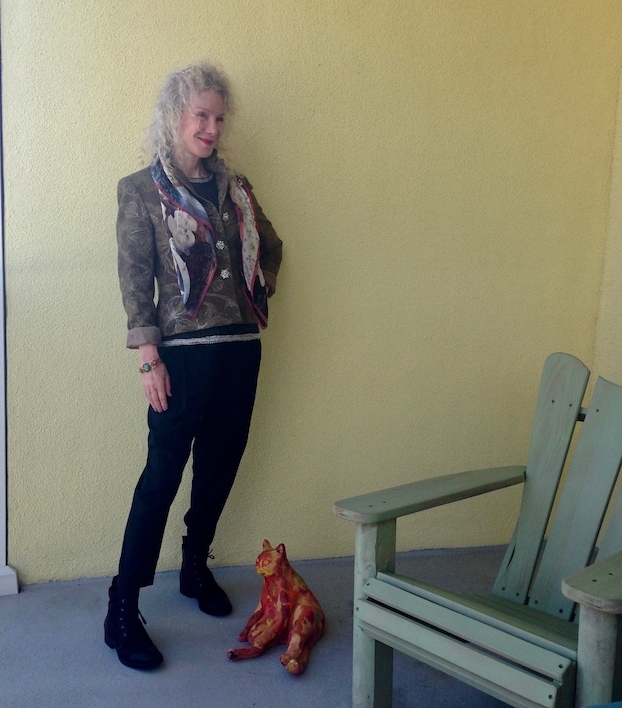 Great jacket – I would easily wear it with jeans (my staple) and booties! The buttons on that jacket are quite the standout Patti!! Totally messed up my photo; I am terrible at this but I do love your blog! Great jacket, Patti…that’s a real find. Thanks for the link up! Great jacket, and I love all the details. The buttons are awesome. Have a great week, Patti!